The DOCG Barbaresco is in the wine-rich area of Piedmont in Northwest Italy, a two-hour drive from Milan and an hour and half from the French border. The tiny district includes the three villages of Barbaresco, Neive, and Treiso, covering 1,250 acres of Nebbiolo grapes that produce around 208,000 cases of Barbaresco every year. Separated from the Barolo region by the town of Alba, Barbaresco is covered by vineyards dominated by three varieties: Nebbiolo, Dolcetto, and Barbera. Nebbiolo is always planted to the best areas, where the composition of the pre-Alpine soils, aspect, sun exposure, and expert human touch combine to create the magic of Barbaresco wine. This recognition of excellence wasn’t always the case. 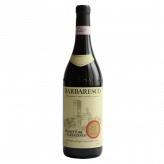 Before 1894, Nebbiolo grapes were sold to make Barolo wine, or simply labeled “Nebbiolo di Barbaresco”. In 1894, Domizio Cavazza, headmaster of the Royal Enological School of Alba and a Barbaresco resident, created the first cooperative, the “Cantine Sociali”, by gathering nine Barbaresco vineyard owners to make wine in the nearby castle he owned. Cavazza understood the nuance between Nebbiolo grown in the different areas of Barolo and Barbaresco, and he was the first to recognize these differences on a label. Fascist economic rules shuttered the Cantine Sociali in the 1920’s. In 1958, the Barbaresco village priest, recognizing that the only way the small properties could survive was by joining their efforts, gathered together 19 small growers and founded the Produttori del Barbaresco. The Produttori del Barbaresco now has 56 members and manages 250 acres of Nebbiolo vineyards in the Barbaresco appellation (this accounts for almost 1/6 of the appellation’s vineyards). Each family is in full control of its land, growing Nebbiolo with centuries-old skill and dedication.